Any manager can check in from a laptop, tablet or smartphone. Etela-Karjalan Jatehuolto (EKJH) is a waste management company located in Lappeenranta, Finland. One of their remote pump station’s control systems failed, and they began seeking new alternatives to replace the failed system. With the control system down, personnel would need to visit the remote site and manually take readings and make any adjustments to the pump system. The pumps were in fine working order, but with the control system down, personnel needed to make many time-consuming trips to collect data and validate pump operating conditions. EKJH is managing the pumping of waste from nine municipalities to a central waste treatment processing plant. The main treatment plant is quite large and requires employees to use vehicles to get from one end of the plant to the other. The primary requirement of the remote pumping station is to provide a constant and consistent inflow to the main waste treatment plant. Originally, the remote pump station had an operating control system that monitored the consistent delivery of wastewater and collected environmental data for reporting. After examining multiple offers, EKJH chose a solution that included new automation hardware and electronics, on-site installation and end user training. The user interface is custom made for each process. It creates a digital twin of each actual pump station, then that digital imagery is provided to the user online. Access to the system is provided to authorized users, so that monitoring and system control can be done from any authorized smartphone, tablet or PC. The portal is user friendly and makes navigation, management and analysis of the system easy and safe to use. “We chose this solution because they offered us the best service,” said Sami Huotari, site manager at EKJH. “Experts visited the site several times and closely examined the pump station and previous automation system. They carefully listened to our needs. The provider delivered not only what we required, but also made suggestions to improve pumping station operation, as well as collection and analysis of the data. “After the initial meetings when everything had been agreed, I didn’t have to do anything. The company provided a turnkey solution to our problem. ”The goal was to supply a complete solution. In EKJH’s case, the provider programmed and installed the automation system. They subcontracted additional electrical connections for the new system. They did not want the end user to deal with additional electrical connections, installation, programming and general project management. One of the main tasks of the new control system was to collect data from the pump station regarding the exact amount of pumped wastewater. Even before the previous control system became disabled, data had not been complete and still required Huotari to visit the pump station on a regular basis to collect data. When the system failed, it required much more frequent, time-consuming trips to the pump station. Image 2. 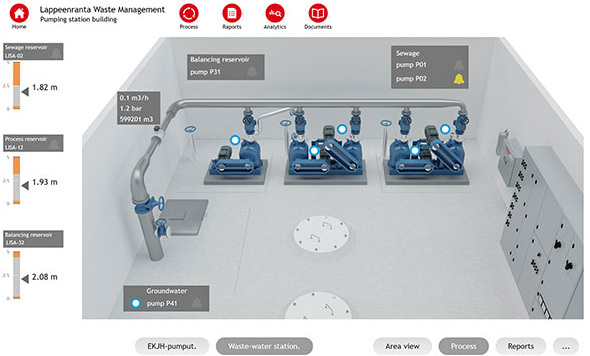 Packaged pumping system digital twin image. In the EKJH project, the monitoring company was monitoring pumps from a different manufacturer. The software can be used by any pump brand or style. Another part of the upgrade was installation of additional instrumentation that helped to provide intelligence and reporting that are early warnings of failing equipment. The main water tank is situated under the pump station. Especially in the spring when snow is melting, the water level can rise quickly. If the pumps are not adjusted accordingly, the tank can overflow. To eliminate this risk, the service company recommended adding a variable frequency drive to the tank level pump. If the water level rises suddenly to above the limit, it automatically adjusts the pump speed. The system sends notification of any adjustment via email. Image 3. The classifier or thickener has a few inputs such as inflow, flocculant feed rate, overflow, underflow and rake speed. All of these inputs and outflow of the thickener can be monitored to dramatically improve thickener performance. Poor process results in a thickener that can often cost hundreds of thousands of dollars to downstream filtration costs. Experts at the service company are continuing to monitor the EKJH pump station after installation. Further optimization of the process can be done as the system continues to collect and analyze data and employ machine learning. One example is decreasing the speed of the tank level pump. This small adjustment prolongs the continuous pump operation and provides more even flow to the main wastewater treatment plant. It can also reduce downtime and can drastically improve profitability and productivity. 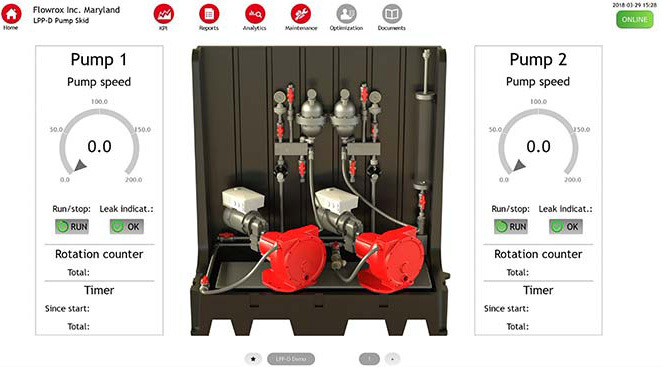 IIoT monitoring of assets helps detect minor damage and allows maintenance teams to quickly diagnose and fix assets before much larger repairs are needed. The major shift at the plant occurs when maintenance teams become proactive rather than reactive. Todd Loudin is president at Flowrox. He may be reached at todd.loudin@flowrox.com or 410-636-2250 ext. 115. For more information, visit flowrox.com.